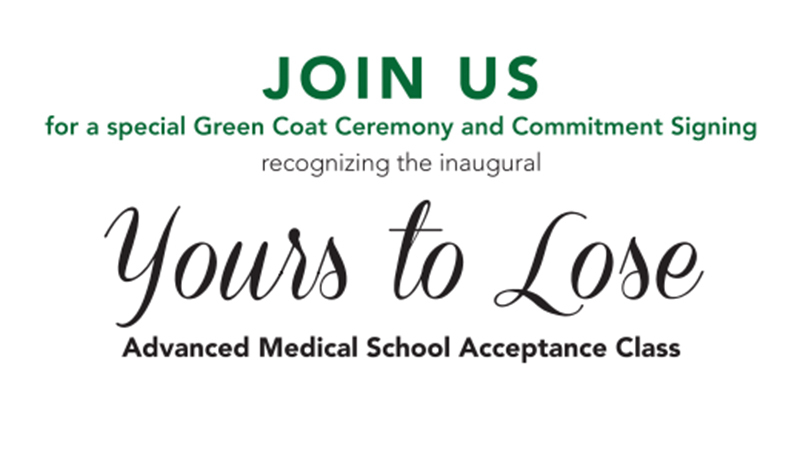 A Green Coat Ceremony for the future physicians making up the inaugural Yours to Lose cohort will be held at 11 a.m. Saturday, Aug. 19, in Connor Ballroom at Missouri Southern. The event will be emceed by Dr. James Donelson, a faculty member and part of the Yours to Lose selection committee. It will include remarks from MSSU President Dr. Alan Marble and other representatives of Missouri Southern and Kansas City University of Medicine and Biosciences. The Yours to Lose – Advanced Medical School Acceptance Program is an exclusive, one-of-a-kind partnership with KCU. It allows a cohort of Missouri Southern students to be admitted to KCU’s new Joplin medical school at the same time they are accepted to MSSU. As pre-med students, they will obtain their bachelor’s degree in biology during an accelerated, three-year course of study before seamlessly transitioning into their first year of medical school. The program will not require them to take the Medical College Admission Test (MCAT). The coating ceremony will mark the start of the students’ academic career and early acceptance into medical school.